The winning teams from the big boat classes at the ICRA Nationals Denise Phelan’s Jump Juice, Class Zero and Ian Nagle’s Jelly Baby, Class One. 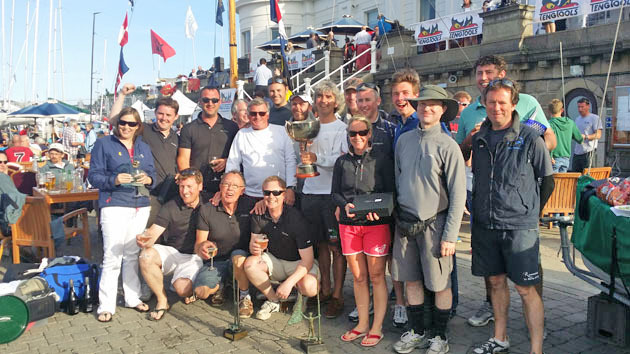 At the ICRA Nationals held at the Royal Irish Yacht Club during the weekend, an event which suffered badly from lack of wind resulting in the loss of racing on Saturday, Royal Cork yachts won the two Big-boat classes of the weekend. Denise Phelan’s Jump Juice won Class Zero with a comfortable ten-point lead due to four race wins and two second places. Ian Nagle’s Jelly Baby won the Class One title for the second time since 2012 though with twenty six boats in this fleet, the win was less straight forward despite three race wins.